(Thursday) and ends on 19th March-2018 (Monday). 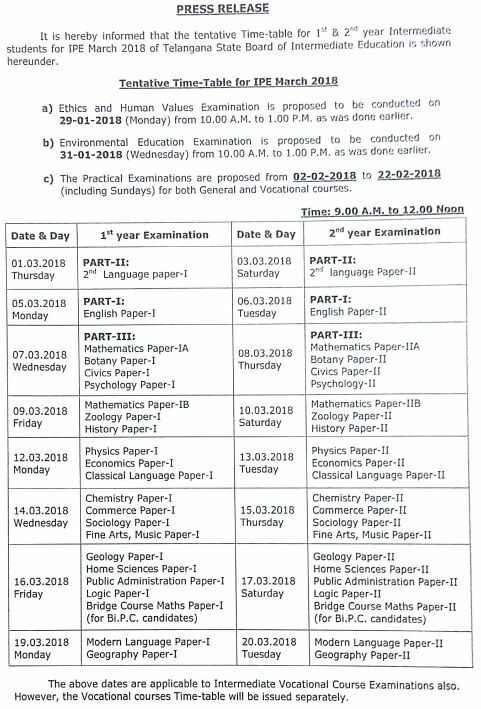 Telangana Inter 2nd Year Exams are going to be start from 3rd March-2018 (Saturday) and ends on 20th March-2018 (Tuesday). TS Intermediate Practical Exams are going to be held from 02-02-2018 to 22-02-2018 for both general and Vocational Intermediate Courses. 1st year/ 2nd year Students are advised to download TS IPE 2018 time table from the Telangana Board of Intermediate Education official website link given below. Telangana state Board of Intermediate Education is going to conduct Sr Inter/ Jr Intermediate annual exams in the month of March 2018. TS IPE Exam-2018 Admit Cards available from January-2018. 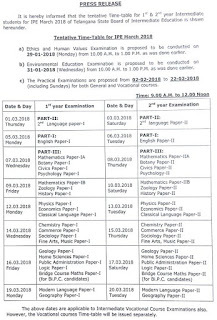 See the below given information Telangana Junior/ Senior Inter Public Examination Time Table/ Admit Cards and Practical Examination Time Table- 2018. -Practical Examinations are proposed to be held from 02-02-2018 to 22-02-2018 (All days including Sundays). -Ethics & Human Values Examination is going to be held on 28-01-2018 (Monday) from 10.00 AM to 1.00 PM. -Environmental Education Examination is going to be held on 31-01-2018 (Wednesday) from 10.00 A.M to 1.00 P.M.